In additional tutorials, this application is scaled out and updated. In previous tutorials, an application was packaged into a container image, this image was uploaded to Azure Container Registry, and a Kubernetes cluster was created. 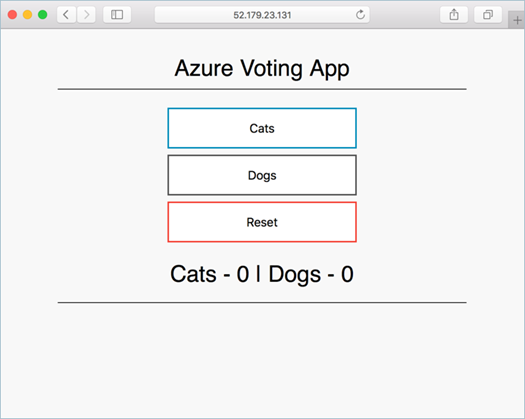 To complete this tutorial, you need the pre-created azure-vote-all-in-one-redis.yaml Kubernetes manifest file. This file was downloaded with the application source code in a previous tutorial. Verify that you've cloned the repo, and that you have changed directories into the cloned repo. If you haven't done these steps, and would like to follow along, start with Tutorial 1 – Create container images. This tutorial requires that you're running the Azure CLI version 2.0.53 or later. Run az --version to find the version. If you need to install or upgrade, see Install Azure CLI. In these tutorials, an Azure Container Registry (ACR) instance stores the container image for the sample application. To deploy the application, you must update the image name in the Kubernetes manifest file to include the ACR login server name. Save and close the file. In vi, use :wq. If the application didn't load, it might be due to an authorization problem with your image registry. To view the status of your containers, use the kubectl get pods command. If the container images can't be pulled, see allow access to Container Registry with a Kubernetes secret. Advance to the next tutorial to learn how to scale a Kubernetes application and the underlying Kubernetes infrastructure.